« For Heaven’s sake, why on earth would you “de-gay” yourself? 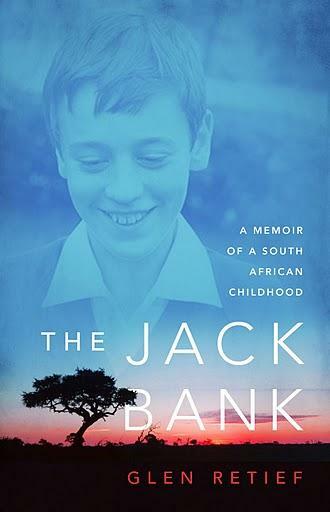 Jazzed up on my performance enhancement drug of choice (Trung Nguyen Vietnamese coffee brewed in my Bialetti Italian stove top espresso maker) I begin a four-part review of Glen Retief‘s new book, The Jack Bank, A Memoir of a South African Childhood. Childhood can be such a murky, shadowy time when viewed from the lofty perch of adulthood. Nostalgia mixed with fragmented memory and family folklore make the job of reconstructing the past a potential hazard. When I first read a draft of Glen’s book, I was struck by the power of his voice, particularly the honest, eyes-wide-open voice of his boyhood self that emerges early on in the memoir. Glen Retief grew up in Apartheid South Africa, a privileged white boy who lived much of his childhood on one of the world’s most famous animal game reserves–Kruger National Park. Literally surrounded by lions and leopards and hippos (including the one that blundered into the family garden,) Glen artfully recreates key moments in his childhood that reveal dangers far greater than animal predators in the bush. In the following excerpt he reflects on his otherness, a son of English South Africans living in a rural compound of mostly Afrikaner decedents of Dutch colonists. While focused on his own differences among other white folk, in this scene he exposes his childhood remembrances of the Black South Africans in his world but not of his world. His society raised him to be racist in subtle disarming ways. Afrikaans versus English is not the only cultural dissimilarity that I know in that staff village; but it is the difference that presses upon my consciousness: squeezes it. Black people, for example, appear in the mornings to make our beds and work in our gardens. They are different from us, there is no doubt about it; they like to listen to pennywhistle and mouth organ music on the radio; once when we gave Sara, our maid, a lift back to her home in the tribal area outside the game reserve, I noticed that she slept on a bed raised on bricks—Daddy told me this was because she feared the tokoloshe, a mischievous goblin who spirits black people away. But by afternoon, here in the village, black people disappear from my world, back to their compound more than a mile away, on the far side of the tourist camp. They are not permitted to use our village store, tennis courts, swimming pool, or golf course, so they exist only in the background of my childish world—undertone notes. There is something essentially flimsy or ephemeral about them. Like the cicadas or crickets they are more heard than seen. Tomorrow I will share a scene from the book in which Glen is sent away to a state-run boarding school where he faces a an oppressor who will baptize him into the institutionalized violence of Apartheid South Africa. That sounds incredibly interesting! Will have to go get it. How Do I Know if my Spouse is Gay??? ?